The head of a Russian advertising agency tasked with creating large building facades to promote the 2018 World Cup in Russia has come under fire for using one of the nearly 50-meter-tall facades to pay tribute to his wife, by using her as the model. Ivan Panteleev, director of advertising agency Novatek Art has been criticised by street artists and members of the general public for putting a giant portrait of his wife Daria on a building facade funded by the Moscow city budget. Four murals were commissioned and co-sponsored by the city’s public relations committee in 2016, to remind the people of Moscow of the upcoming (now ongoing) World Cup, and some people didn’t like that Panteleev used his wife, of all people, as the model for one of the giant artworks. “Usually, Ivan says his critics are just jealous. In this case – we’re definitely jealous. Don’t we all wish we had husbands like that, right ladies?” gallery director Anna Nistratova wrote in a sarcastic post on her Facebook page, after Novatek Art posted a photo of the controversial facade on its Instagram. 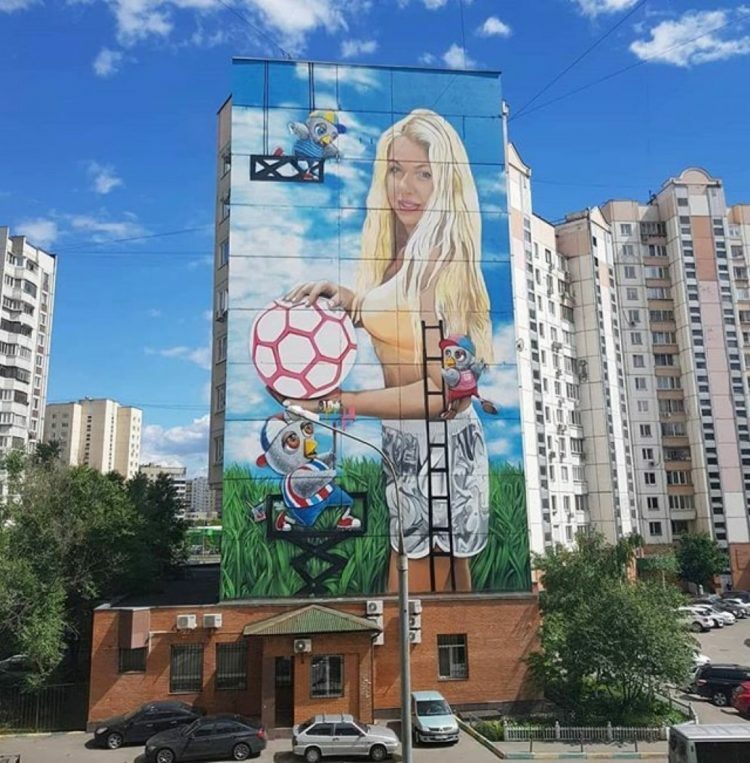 The resemblance of the blonde model depicted on the facade holding a football and Daria Panteleeva is quite striking, so Novatek Art’s director didn’t even try denying that she was the inspiration for the artwork, telling Reuters “It’s true that the model for this painting was my wife”. While some people didn’t find this revelation particularly interesting, there were those who criticised Panteleev, whose company has been cooperating with the Moscow mayor’s office and other authorities since 2011, earning tens of millions of roubles from various contracts, for his decision. It was Daria Panteleeva herself who defended him. “If an artist or an organizer is commissioned to paint a ‘blonde Russian woman with a ball’… why should anyone care if the artist paints a woman they know or a stranger?” she wrote on in a social media post. That’s actually a fair point, which begs the question – why did Novatek Art take down the photo of the controversial facade from both its Instagram and Facebook pages while leaving the other ones up?